As you know by now, we're really not people who in any way, shape or form, appreciate a "ready meal" of the supermarket type. Indeed, I spent a LONG time in one supermarket (name begins with T....) studying all the "ping" meals available. High salt levels come as standard, it seems. It's incredibly difficult to get a tasty sounding ready meal at a sensible price without extraordinarily high levels of something, be it salt, fat or sugars. In fact it's still quite difficult even if you start to look at the "premium" ones, which came as a bit of a surprise. Takeaways are great but again the possibilities for healthier stuff there are relatively limited and anyway I don't want to be eating takeaway several times a week as standard. So thinking laterally was needed. We have a camping stove - so that enabled stir fries...but only having one ring meant needing to look at the "straight to wok" type noodles. The Ambient ones in the sort of squishy block didn't feel terribly appetising to be honest, so instead we tried the "fresh" egg noodles which are frequently sold alongside the stir fry ingredients. At £1 a pack they're obviously quite a lot pricier than the dried ones we've always eaten, but I have to confess we found them REALLY tasty, so yes, that is something we will take forwards happily enough for continuing to eat. Salads obviously have been easy to throw together as they can be prepared in the limited space we had available. The bags of prepped veggies (much as it pains me to buy them!) have been useful as you can steam them in the microwave - and an incredibly handy "microwave grill plate" bought for us by my parents a few years back but rarely used until now has proved to be excellent at cooking things which wouldn't normally seem ideal for microwave cooking. One dish we'll definitely be taking forwards for the future evolved due to me wanting to come up with something that took almost no space to prep, and required no actual cooking at all. All that is required for this dish in terms of equipment is a chopping board and sharp knife, a bowl big enough to hold all the ingredients mixed together, and a fork for combining it all. (so minimal washing-up as well - also a consideration when washing up is being done in a bowl in the bath...!). 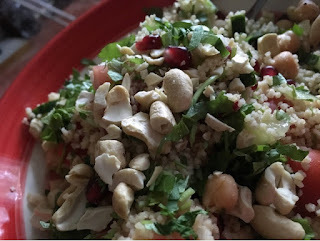 For my Jewelled CousCous Salad you'll need the following: Sufficient dry couscous to serve two people; a pack of prepared pomegranate seeds; a bunch of parsley, cashew nuts, fresh tomatoes - the juicier and riper the better; a can of chick peas. Make the couscous (I use wholewheat as I find it has more flavour) up as normal - you can add a knob or two of butter if you like, or indeed a squeeze of lemon juice. Salt & pepper to taste. Once you've poured the boiling water over shove a plate on top of the bowl and leave it to steam & absorb, while you chop the parsley, cut up the tomatoes, and open and drain the chick peas. Fluff the couscous with the fork and then fold in each of the other ingredients in turn - you want to get everything well distributed through, and make sure that any juice with the pomegranate seeds gets in there as well. Finally serve into bowls and top off with a handful of lightly crushed cashew nuts each. Seriously tasty and SO pretty to look at as well! I reckon that it would be even tastier with lightly toasted cashews, but even with them straight from the pack like this they still add a lovely crunch and almost creamy flavour. The pomegranate seeds give glorious little bursts of sweetness,and then there's the juicy tomato and the nutty chickpeas - somehow it all just works brilliantly together! This recipe is definitely a keeper for me - it's always great to have nice simple meals that can be thrown together fast and create the minimum of clearing up, after all! For years there has been "opposition" and snobbery inside the question of food, and eating. From Weightwatchers -v- Slimming World - right through to the current "Clean eating - good, or evil?" debate, people love to disagree, and with food being a subject close to many of our hearts, it's not surprising that it can provoke strong feelings. Equally there have and will always be people who are keen to promote an extreme for whatever reason - Cabbage Soup Diet to Atkins - if you particularly want to eat in a particular way, you can probably find a "diet" that will suit your requirements - whether it's good for you is another question! One thing that the current clean eating trend has in common with nearly every other diet out there is that it persuades us to see foods as either "Good" or "Bad" - but is it healthy to teach people to demonise foods like this? I like a pomegranate seed as much as the next girl, and I'm even partial to a bit of kale here and there, but equally I also thoroughly enjoy the occasional bacon sandwich on packet white, Gooey bacon, brie and Cranberry ciabbata, or packet of good old Walker's Ready Salted. Are any of those things going to kill me? No, if they're eaten occasionally, rather than on a daily basis, probably not. Do they make me happy? Yes - damn right they do, and that in itself means that eating them occasionally has one great big fat (sorry!) benefit right there. Sure, I have food "principles" - I'll only buy free range eggs for example - and would rather go without than eat battery ones, and I've not eaten McDonalds food since news of their political leanings in the 1980's became public knowledge, but generally speaking, I'm not going to be storming around telling you that your choice of breakfast, lunch or dinner is in some way inherently evil, and neither should anyone else be doing so. A quick google on the question of Clean Eating turns up a lot of different, and much conflicting, information - and yet some of it is pure common sense and may well provide a key to why so many people have sworn that they've successfully lost weight on one of these plans. Learn about proper portion sizes - well, yes! I'd be the first to acknowledge that I'm not always the best with that, but it is logical to only eat the right amount of whatever you put on your plate. Read Labels, says another one - educating yourself about what is in the foods that you're buying can never be a bad thing, surely, but how many of us really question the stuff that finds its way into what we eat? Some of it is a bit less practical "Eat 5 - 6 small meals every day" - well, yes, great in principle, but for the majority of us with 9 - 5 jobs, that's not really all that user-friendly, is it! Then there's the confusing; "Drink half your bodyweight in ounces of water each day" - well that's brilliant, but what measurement are we using for the body weight?! "Avoid all calorie dense foods containing no nutritional value" - not actually that easy to find a food with no nutritional value at all, calorie dense or otherwise... My personal favourite "avoid chemically charged foods" - well that puts the Kibosh on the 2 - 3 litres of H2O they say you should drink a day, huh? Interestingly nearly everything I found on a quick image search for "principles of clean eating" on google seemed to originate from the US - and I'm always inclined to be suspicious of a nation that is too busy to say the "ed" on the end of mash when they talk about potatoes. How about we all jump off the "fad" bandwagon and ditch the "diets" and start actually thinking about what we choose to put in our mouths with a bit more logic? Make the bulk of your food across a week healthy - and eat it in sensible quantities. Eat slowly, actually taste your food, and stop eating when you start to feel full. Think about the amount you put in against the amount of energy you've expended in the day - a busy day where you've done some exercise will need more calories replaced than one in which the limit of your exertion is reaching for the remote control. Listen to what your body tells you - do you know we're actually born without a taste for particularly sweet things - the desire to "eat sweet" is gained as we grow up, probably because mostly we're taught to regard sweets as a treat - not a criticism at all, that's just the way things are. Interestingly I've found that the less sweet stuff I eat, the less I want. Of course I have the odd slice of cake or bit of chocolate, but generally speaking I very rarely crave those things. Since I've been thinking more about the refined sugars I eat, there is no question that I have wanted sweet stuff less even than I did before, and that certainly does suggest that those sorts of cravings can be "cured" at least in part. If you're thinking about a particular diet or eating plan that tells you to cut a particular foodstuff out completely, ask yourself whether that is sustainable in the long term, and if not, whether in fact you'd do better to follow a different path. Thinking about changing to a way of eating which we can take forwards as a lifestyle choice, not just plan to follow as a "diet" might actually enable us to break the yo-yo dieting habit for good - after all, if the food we're putting on our plates looks appetising and makes us look forward to eating it, it stops feeling like a hardship, doesn't it! Given a choice between feeling deprived, and feeling fulfilled, I know which I'd choose!